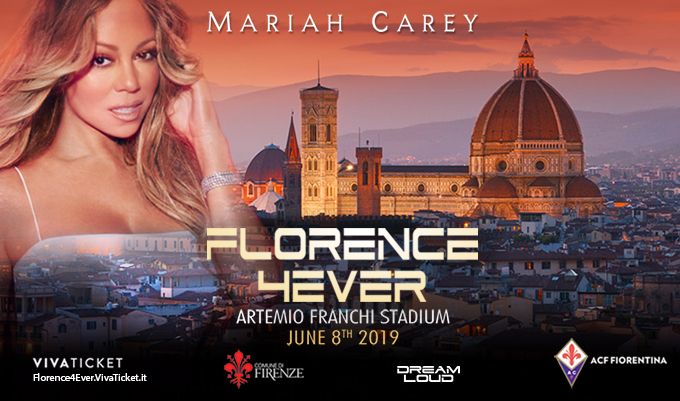 Mariah is coming to Florence4Ever, a pop symphonic experience and city celebration for the people of Florence, Italy, on Saturday, 8 June at Artemio Franchi Stadium. The event will also feature co-headliner, John Legend. The 4Ever show is the only mainstream music festival that promotes and fully integrates all aspects of the cities which host it. In Florence, it has paved the way for a revolutionary partnership between Dream Loud Productions and the ACF Fiorentina football club, merging city, sports and music under one cohesive brand and platform. The team will play with "Florence4Ever" on their jerseys for the remainder of the 2019 season, the first time that the Fiorentina shirt has ever included the name of the city in which they play. Florence Mayor Dario Nardella says, "I am pleased and proud that Florence will be hosting Florence4Ever for the first time, a major international event featuring great stars of world music." Tickets go on sale to the public on Wednesday, 6 February at 12:00 CET, and registered Honey B. Fly members can receive a limited time 15% discount when they purchase tickets! This is a special consideration given to Honey B. Fly members. Please do not share the 15% discount code with non-members. The ticketing link and code will display when tickets go on sale, 6 February @ 12:00 CET. Go to the TOUR page and scroll down to the 8 June Florence show. You will see the member code above the GET TICKETS link. Enter the code as it is displayed, in all-capital letters. The 15% discount code is valid until 3 March 2018, or until the limited quantity of special-priced tickets is sold out, whichever comes first. The discount code is valid for up to two (2) tickets. If you purchase additional tickets, they will be charged at standard face value.